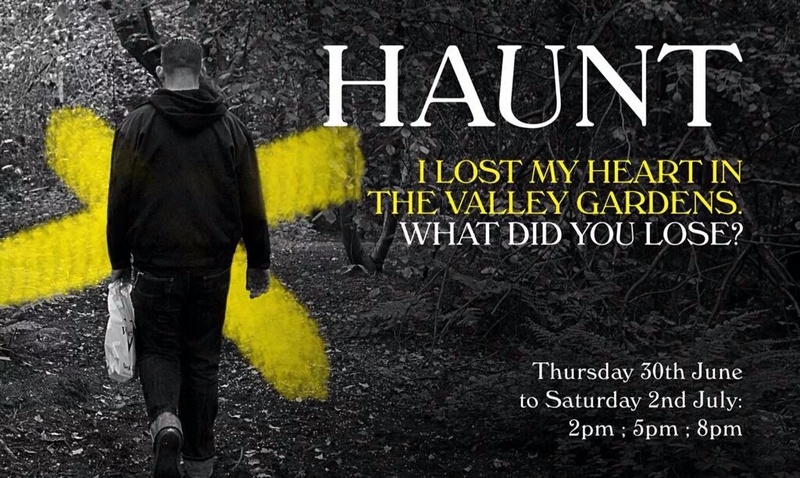 In Harrogate, this week a site specific theatre piece, Haunt will be taking place. Billed as ‘a ghost tour with a difference’, Haunt has been developed working with writers who have experienced homelessness in Harrogate. Based on words from the Haunt anthology and material shown in the Royal Pump Rooms as part of Harrogate Stories, Haunt is a guided journey arriving at a place where images, music, words and performance ask : Who are the haunted? Who are the ghosts? Along with Steve Toase, whose brainchild the project was and Tessa Gordziejko, I’ve been involved from the beginning, working with participants, co-writing the script and now performing. When I’ve talked to people I’m close to about the project, they have sometimes responded with, ‘But you weren’t homeless, were you?’ I know what they mean. Things had been difficult in my family home for a number of years and for a number of reasons. Then, in 1994, when I was 18, there was a huge argument and it was suggested that I leave. I wasn’t exactly thrown out but I felt staying was untenable. I wasn’t a street sleeper – I only once slept outside, in the Valley Gardens as it happens, and this was a choice. My partner wasn’t welcome at the place I was living so, if I wanted to spend the night with him, my only option was to sleep on the grass with his sleeping bag over the top of us. In the morning we were woken by someone prodding us – apparently they were concerned that we were dead. I was lucky. Some people are forced into street sleeping. Others have to stay in hostels. Others sofa surf. The first tide of leaving home brought me to Chris’s sofa. Chris was a generous friend and clever, creative man who has now sadly passed away. In his spare room he was putting up Adam, who, like me, had no place to be. I soon migrated into the spare room and into a turbulent but exciting relationship with Adam. Adam and I found a self-contained flat. Compared to most of our friends who were secreted away in bedsits, this was a luxury, a ‘pad’. And didn’t everyone know it? It was a party place, day and night, always overcrowded. Central to town, there was easy access through a window that did not lock. I can’t remember a night where there wasn’t at least one person sleeping on our floor. When I couldn’t bear it any more, I used to pull the quilt over my head and hope everyone would go away. They didn’t. I went hungry often when benefits payments weren’t made and we didn’t eat for days or I made bad decisions and spent what little I had on rolling tobacco. That kind of hunger is painful. You’ll know what I mean if you’ve ever experienced it. I’m not saying living there wasn’t fun at times but it wasn’t safe. It was never safe and it wasn’t home. Dodgy things were happening in the flat and people would turn up threatening and sometimes enacting serious violence. I knew I had to get out. Luckily for me my mum took me back for a while. Just before I had my son, Adam and I found a house to live in. But things didn’t work out with Adam who was still embroiled in unhealthy lifestyle patterns and, when we almost lost our home for the second time, I called an end to it. I re-engaged with study and, after an Access Course obtained a place at the University of Leeds. I handed in my notice after finding somewhere to live in the city. But, as a single mum on benefits, they didn’t trust me to pay the rent and pulled out a week before I was due to move in. Again I found myself with no home of my own. After a short spell at my mum’s and then in a rented place with a friend, Unison found us somewhere to live – I wasn’t eligible for university accommodation. For two years we were safe within four walls. I had a succession of flats (damp and all) that I could stay in without fear of being thrown out. When I finished university and still wasn’t able to find a job that would pay the bills and cover the cost of childcare, I fell on vulnerable ground again. I wasn’t eligible to stay but I couldn’t find anywhere else that would accept benefits – Leeds landlords prefer to rent to students. The council put me on their homeless priority list but didn’t manage to find me a place in the 4 years I was on it. Eventually, in 2003, my son and I were given a lovely housing association maisonette. I had found somewhere I could call home. It wasn’t perfect – I was living next door to someone whose paranoia and aggressive behaviour when unwell was sometimes turned on me. But it was a place my son and I could make together, a home we were even allowed to decorate. It would remain so until, by now making a living as a writer and workshop facilitator, I bought a house with my husband in 2011. That is my story (or some of it). I’m sure many of my readers will have experienced vulnerable housing or homelessness at some point in their past. But whether you have or haven’t, you might be interested in seeing the show – a true collaboration of stories related to this topic.